What a difference a decade makes. 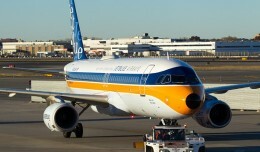 US airlines have cut costs, slashed workforces and, largely, evolved to fee-based revenue models. But one of the biggest, and sometimes overlooked, changes was the consolidation and retrenchment of hub airports since 2000. While not unsurprising, the shift has created a whole new geography of hubs. Airline traffic nationally rose roughly seven percent to 786.7 million passengers in 2010 from 733.9 million in 2000, according to US Department of Transportation statistics. Over the same period, the number of hub airports decreased to roughly 30 (depending on how your counting) from around 40 ten years ago. The winners of this shift were those in the south, west and ones serving the country’s largest cities, for example New York and Chicago. The losers were mostly in the midwest. The shift in hubs matched population trends. The US population rose 9.7% to 308.7 million during the decade with 84.4% of that growth driven by increases in the south and west, according to 2010 census data. The largest metropolitan areas also grew, for example the New York region expanded by 3.1% to 18.9 million people during the period. Existing hubs in these regions experienced the most growth. At Charlotte Douglas International Airport (a US Airways hub) enplanements rose by 62.4%, at Denver International Airport (United Airlines, Frontier Airlines and a Southwest Airlines focus city) by 37.3% and at New York’s JFK International Airport (American Airlines, Delta Air Lines and JetBlue Airways) by 41.9% from 2000 to 2010, according to Federal Aviation Administration (FAA) data. All were existing hubs but the latter two benefitted from the introduction of service from Southwest Airlines (Denver) and JetBlue’s launch in 2000 and impressive decade of growth (JFK). Airports in the midwest experienced the greatest losses. The same FAA data shows a drop in enplanements at Cincinnati/Northern Kentucky International Airport of 65.2%, at Pittsburgh International Airport of 59.5% and at Lambert-St. Louis International Airport of 60.5% over the course of the decade. Each airport was formerly a hub, Cincinnati for Delta Air Lines (the airline still considers it a focus city), Pittsburgh for US Airways and St. Louis for American Airlines (acquired through its 2000 purchase of TWA). Today, travellers at these airports will see shuttered concourses and experience eerily quiet facilities that were built for far busier days. This new geography has changed the American travel experience. 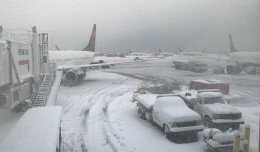 Almost every US airline, as they cut smaller hubs and trimmed capacity in their efforts to stay solvent, has focused their networks on a few mega hubs. US Airways, once a major player in the northeast with point-to-point routes from smaller cities to almost every major airport from Washington to Boston, now flies almost exclusively to its hubs – Charlotte, Philadelphia, Phoenix and Washington National – from nearly every airport it serves. Earlier this month, The Arizona Republic reported that Las Vegas McCarren International Airport, once America West Airlines (which merged with US Airways in 2005) second largest hub, would only have flights to the airline’s hubs beginning in January – a sad finale for a once mighty focal point in its route network. 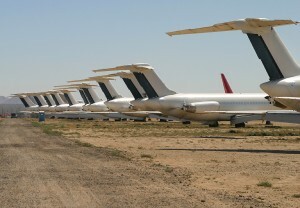 Poor decisions can end up making your airline's next hub at the Mojave desert for long term storage. US Airways is far from alone. American is in the process of consolidating all of its flying through its five cities – Chicago O’Hare, Dallas/Ft. 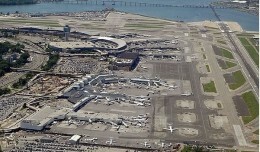 Worth, Los Angeles, Miami and New York JFK and La Guardia. Point-to-point routes, even those to former hubs like Raleigh/Durham, have been slashed and frequent fliers find themselves with a sometimes all too intimate knowledge of the inside of DFW (full disclosure, the author is an elite-level frequent flier on American). 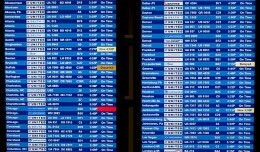 An experience that is repeated across the major hubs and airlines. 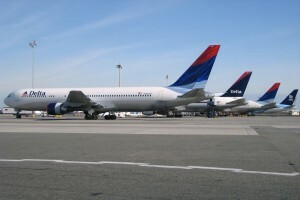 Delta has retrenched to its main hubs at the expense of Cincinnati and Memphis and few expect United, which is in the process of merging with Continental Airlines, to keep Cleveland as a hub for very long. Former hub airports do face an interesting conundrum – how to shrink an airport? For now, it seems temporary walls and deserted spaces are the answer, but there must be a better way. Perhaps a proposal like Clare Lyster’s to move local civic facilities, such as schools or municipal offices, into an expanded O’Hare should be considered for vacant terminals and concourses. Lyster is a principal at the CLUAA architecture and urbanism studio in Chicago who released her proposal for the expanded airport last year. One adaptive reuse of a facility is in Cincinnati, where visitors can sign up for tours of the airport grounds and facilities. As population continues to shift hubs will undoubtedly follow. 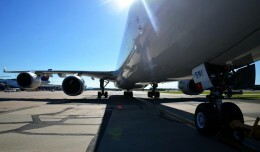 Cities like Charlotte, Denver and New York are expected to continue to grow and airlines will match that by deploying additional resources at these airports, slots permitting. But, just as this past decade was full of surprises, the next will probably be as well and the next geography of hubs is still anyone’s guess. Edward Russell is a financial journalist and airline enthusiast based in New York. The son of a pilot, he’s been spotting and collecting airline memorabilia since a young age and has been writing about airlines in the US and Asia since 2006.